Some of us have really clear ideas about how we’d like to give birth. Some of us are motivated by our fear of birth, seeking out anything to ease our minds. We might be hoping for a natural birth, a drug free birth, anything but a caesarean, or might hope that we can be in control and calm, or not ‘freak out’. Sometimes we are trying not to think about birth at all. Whether we are scared, determined or unsure, the way we choose to prepare for our birth experience can impact on how we come out the other side. When we are seeking birth preparation it’s quite common for us to look for the class that most resonates with us. Maybe it’s saying all that we are longing to hear, that makes us feel hopeful? Perhaps there’s an implication on the website or flyer that by taking the class we can achieve the things we want- ‘calm’, ‘positive’, ‘in control’, ‘blissful’, ‘empowering’, ‘pain free’ and so-on? Let’s face it, we tend to choose a class based on what we want to hear (whether or not it’s realistic or truthful for most), and what makes us feel most comfortable. Perhaps though when approaching such a major life transition as becoming a parent, that commonly turns our world a little (or a lot) upside down, being ‘comfortable’ and ‘idealistic’ is not always the healthiest approach or the best way for us to prepare? As an experienced childbirth educator who taught the ‘positive, calm, empowering’ birth class for 6 years, I agree that the appeal is obvious- I too was drawn in by the promises implied. After some time though, I came to see that although these classes can increase our confidence and trust in the birth process, they can do so in an unrealistic way, and set up many of us to feel like we missed the mark, to feel let down, unprepared, overly confident and even like we failed in some way. These classes can be quite outcome focused, and this can be problematic in birth preparation. When I say ‘outcome’ I’m not even taking about such things as achieving a vaginal birth or drug free birth. When there’s an idea that we can stay calm and in control no matter what turn our birth takes, or that we can have a positive or empowering birth because we choose to- these are outcomes that can’t always be achieved no matter what choices we make, what we know, or how well we prepare. Ideas like this though they might seem well intentioned and harmless, can actually set many of us up for disappointment and trauma. Many women who do these classes can only stay calm to a point, and then often find themselves with few coping skills left. Because I care very deeply about the couples I work with, and could see the downsides of this approach, I could no longer go on teaching that kind of class. I got to the point where I felt like I was lying to couples in my class (and essentially I was), so I had to find an approach that while confidence building, did this is a realistic, helpful and meaningful way. In my work as a birth story healer I have a unique perspective that most childbirth educators don’t. Having worked with over 500 couples and two different childbirth preparation methods, as well as working with people after birth who have experienced let down, disappointment and trauma, I deeply understand how different approaches can both help and potentially harm us. Sometimes we want to believe that we will be the one who will get our ideal birth outcome, or the birth that is portrayed in the ‘positive, calm’ birth class. We can tend to overestimate the likelihood that we will be the one who does- this is know as ‘cognitive optimism bias’. 80% of us overestimate how well things will go for us, but not for others. In my experience from teaching that class and seeing the follow up birth evaluations, only 15-20% of women seem to really have the kind of birth these classes portray. Others might find the tools helpful-but these women would most likely find any coping tools helpful, and these women could be far better prepared overall, especially when things don’t go smoothly. I have come to see clearly that we need to be over prepared and realistic, not overly confident that we will achieve our perfect birth. Many classes over emphasise the ‘mind over matter’ approach. It’s true that our mind can be a powerful tool in birth, but when this is over emphasised and it’s implied that achieving a certain outcome is greatly under our conscious control, many of us will be let down and unprepared when we don’t achieve what we hope for. When we are offered reassurances to just ‘trust our bodies’ and ‘trust birth’, or recite idealistic affirmations, when we fail to explore the many factors that influence our births, and fail to address fears and concerns head on, we may find ourselves wondering what we did wrong in hindsight, and feeling rather betrayed by such ideas. I’m aware that some women really love these kinds of classes. I thought they were the ‘bee’s knees’ myself before I knew about more holistic ways to prepare, and before I knew the potential downsides. In my experience the majority of women would be better served with a more realistic and open minded kind of class, that focuses on emotional and psychological preparation as much as the mental/intellectual and physical preparation and is not outcome focused. Even classes that say they address fears, rarely do this in a deep and helpful way. In fact often they avoid talking about worries all together for fear it will ‘attract’ them. Ideas like this only serve to make women feel that they must have done something wrong, didn’t believe or trust enough when their birth doesn’t go to plan. The class I used to teach used ‘fear release’ exercises. From my experience, these can lull people into a false sense that they have dealt with their fears, which isn’t then apparent until things haven’t gone to plan. What is often missing here is a conscious awareness of how particular scenarios might be a problem for us, and understanding the meaning we might take from the unexpected. This approach can go far deeper and be far more effective. Think about it- if birth is the entry way into parenthood, it makes sense that it might come with some intensity, challenges, doubt, uncertainty, releasing control, and a fair amount of discomfort. Parenting can be a complex mix of delight, joy and immense love, as well as frustration, hard work, exhaustion, and being pushed to our absolute limits- why would we expect birth to be so different then? Instead of seeking the class that makes us feel comfortable and sounds the most appealing, consider whether the class that is keeping it real, inviting us to be more self aware, exploring our beliefs, approaching fears head on and learning how to cope with ‘not knowing’ might actually be what we need. A class that helps cultivate self compassion in a personal, mindful and deep way can help to take us to places that can be a little uncomfortable, yet is often where we need to go to be prepared for a range of possibilities, not just our ideal birth scenario- which doesn’t happen much of the time. Sometimes a part of us is loving the appeal of the ‘positive, calm, empowering’ class, yet another part of us wonders if it’s too good to be true, or can worry about the pressure of trying to achieve a certain outcome or stay calm and focused. If you’re looking for a mindful, intelligent and mature approach to birth and parenting preparation then I’m sure you’ll love Birthing From Within. I’ve been working hard since 2017 on educating people about birth trauma and the sharing of birth stories. Here are my published articles. You might be surprised to know that around 30% of women describe their birth experience as traumatic, and somewhere between 1.5-9% of women end up with Post Traumatic Stress Disorder (PTSD) after giving birth. Partners, family or friends who witness a birth can also suffer from birth trauma, as can Midwives, Doctors and Doula’s. Let’s look at some common myths about birth trauma and help understand this common issue around birth in more depth. Birth Trauma Myth Number 1: Only women (partners, birth support people) who experience births with lots of interventions, surgery or serious complications have birth upset or trauma. This is not true, although birth trauma is more likely in a birth like this, even women who have very straightforward births can experience birth trauma. Sometimes women (and partners) are simply not prepared for the intensity of birth, it may have been much harder, longer (or quicker) and more painful than expected, or it could be that they didn’t feel prepared for the unexpected when it arose. Women can be left experiencing upset about feeling like they weren’t heard or listened to, if they feel like they weren’t supported in the way they expected during or after the birth, or like their body let them down. Sometimes they can even feel like they let them self down in some way. Upset can also arise from something that occurred during pregnancy or after birth as well. Birth Trauma Myth Number 2: As long as the mother and baby come out from the birth alive that is all that matters. This is a common thing people say when a birth hasn’t gone smoothly or as the mother hoped, ended up with complications and or surgery. As a society we need to stop saying this to mothers! It’s so invalidating and potentially damaging. A woman’s emotional experience and how she is left feeling after birth, is extremely important. A woman who is left feeling shattered, upset or traumatised after birth, also takes these feelings into the rest of her life, into her parenting, her relationship with her partner and other people, and into her relationship with herself. This doesn’t mean that her birth has to go perfectly well in order to be okay. When women are prepared holistically for any possibility (and by this I don’t mean that they can use their breathing or relaxation skills to stay calm when a complication occurs) they can come out the other side whole and okay, yes they may be disappointed or upset, but they have more tools to process and work through this. This is one of the amazing and unique things about preparing with Birthing From Within classes. Birth Trauma Myth Number 3: In order to heal from an upsetting or traumatic birth, you need to re-live or “feel” the event all over again. No, this is not necessary. Although some women find it helpful to write out their birth story and look over/discuss their medical notes, re-hashing or re-telling the entire birth story is not generally done in a Birth Story Healing Circle or private session. Most people attending a circle/session have already told their birth story numerous times and have found it hasn’t resolved their upset. Some may have also avoided telling their story at all. You already know all of the intimate details of your birth story, a Birth Story Healing Circle/Session is a unique opportunity to explore your birth upset/trauma in a new way, re-frame and find a new meaning for yourself. Birth Trauma Myth Number 4: If a woman who has experienced birth upset or trauma goes on to have an easier or more positive birth experience next time, this will heal her birth trauma. Not in all cases. Some women do find great healing for example if they had a caesarean birth the first time and then had a vaginal birth the next time, or if they had some other complication/intervention like forceps/ventouse and then push their baby out on their own the next time etc. For other women, experiencing a positive birth although it can feel like a great achievement, can also serve as a reminder of what they missed out on the previous time, and can even make them feel worse about the traumatic event. Healing trauma isn’t always so black and white. When someone suffers trauma the effects are stored in the body and can effect the person in a variety of ways, this doesn’t necessarily stop even if a woman has a good experience. Birth Trauma Myth Number 5: Midwives, Obstetricians, Doulas and Birth Support people are used to all different kinds of births and rarely experience birth trauma. Although care providers and support people are much more familiar with birth and have usually seen a lot, this doesn’t mean they don’t get upset or traumatised when things go wrong, complications occur or when the birthing woman or her partner have a hard time, or are upset during or after birth etc. Its usually upsetting for everyone involved. Care providers can debrief in both informal settings over a coffee with co-workers and in more formal settings. Birth Story Healing Sessions are also an ideal and unique way for care providers and support people to work through traumatic and upsetting births that they witness. When care providers are able to regularly explore and move through any residual trauma and upset, they can be free to be more present at each birth they attend and be less affected by previous birth experiences. Birth Trauma Myth Number 6: When someone suffers birth trauma or disappointment, they will get over it with time. Not always. Some people do find that time heals how they feel about birth upset or trauma, but this often isn’t the case. Its common to even hear women in their later years still talk about what happened during giving birth with sadness and a sense of loss. Even if the acute symptoms of trauma ease with time, there can still be a lack of completion around the event. Trauma isn’t just an isolated part of a persons life, its usually carried with them into the rest of their life, it can change who a person is, how they cope with stress, how they relate to others and even cause physical symptoms and complaints. Unresolved trauma and more extreme trauma such as Post Traumatic Stress Disorder (PTSD) can have long term effects on a persons well being and can be associated with anxiety, depression, eating disorders and substance abuse. These issues can then also have a greater societal impact on not only the trauma sufferer but their partner, children, family, friends and workmates. Birth Trauma Myth Number 7: Birth trauma and upset are rare. Actually its more common than most people think. Its estimated that around 25-34% of women find their birth experience to be traumatic. Around 2-9% experience Post Traumatic Stress Disorder post birth. This is a huge number of women. For example, at G.V. Health where 1200 or so women give birth each year, there could be as many as 300-400+ women each year who have suffered trauma. This also doesn’t include partners and other family members who have witnessed birth and Midwives, Doctors and Doulas. So the number is probably much greater than this. I personally find this really alarming and clearly there is a need for good support around birth trauma. Birth Trauma Myth Number 8: When someone suffers birth trauma, they feel upset or traumatised immediately after the birth occurs. Not always. After giving birth, even if it has been upsetting, disappointing or traumatic in some way, the effects aren’t always immediate. New parents are usually of course swept away in the hour to hour needs of their newborn, so sometimes this can mask or delay the realisation that a trauma has even occurred. Its also very normal for couples to experience a sense of relief that everything is over and they have their baby, and they will usually feel quite grateful to anyone involved in their birth in the early time after birth. Often they haven’t had time to even process what has happened at this stage, but these feelings can change a lot as time goes on. The reaction of others around them at this time can also play a role in whether trauma becomes an issue, or whether some healing can start to take place. If women (and their partners) have someone who can just listen in a helpful way in the early weeks and months, this can be really valuable. If women’s feelings are not validated, and they are told to feel grateful for a healthy (ie: live) baby and it’s implied that their experience of birth isn’t important, that they aren’t remembering things correctly, or misunderstood something that happened, are just too highly strung and anxious and should just get over it, this can often serve to make the problem much worse. Some women may only realise there’s some upset when they notice their reaction to other women sharing their births, it’s common to feel upset or even jealous when someone else shares a story we feel was perfect, normal or something we wanted. Some women will have flash backs to part of their birth, thoughts re-playing over and over in their mind, or often they will totally avoid thinking or talking about their birth all together. Sleep deprivation and having a baby that is unsettled or unwell can make it harder as well. The effects of trauma are generally stored in our body, so sometimes it isn’t until another upsetting event happens, that we even see the effects. For example, even minor car accidents, an injury, surgery, major illness, witnessing (or being subject to) something violent (even on t.v. ), natural disasters, sudden loud noises, or feeling really isolated or alone can be triggers for trauma. So sometimes one of these events at some time after the birth trauma may actually re-traumatise someone if they haven’t been able to process and heal from the birth trauma. You can see how important it might be that Birth Trauma (and any trauma for that matter) is resolved, as it can cause ongoing problems for the sufferer. Stay tuned for some of the common symptoms of trauma in upcoming posts. Birth Trauma Myth Number 9: Women who go into birth feeling “positive” about it rarely get birth trauma. Women who are fearful about birth are more likely to have problems. Not always. Women who go into birth with overly high expectations and who are overly confident and expecting birth should and will be empowering, pain free (or low in pain), be easy and effortless and that they should be calm, “in control” and quiet, can actually be more likely to feel upset, disappointed and even traumatised if the birth doesn’t live up to their ideal. When we set certain rules or expectations about what it “should” be like, then it can be problematic when it doesn’t pan out that way. In an ideal world, yes I would like to think all women could come out of birth feeling empowered, nothing would be more wonderful. However, we don’t live in an ideal world, an ideal maternity system or in a society that trusts birth and women, or even a society where women are taught to trust their own instincts, we can’t avoid being influenced by these things to some degree. When we believe that we can control everything that happens to us whether in birth or life with just positive or “the right” thinking, this then backfires on us when it doesn’t happen, we then can blame ourselves or whoever convinced us to do that in the first place. The key is to be positive, realistic and flexible, which isn’t always an easy balance. Being prepared for birth by learning ways to cope with labour, picking a birth team that will support your desires, learning how to cope with the unexpected (and by this I don’t mean that you can simply use your relaxation tools to stay calm and relaxed when things don’t go to plan), I mean ACTUALLY really exploring concerns and worries, talking about them, working through them, not just doing a relaxation-fear release exercise like I used to teach in class. These kinds of exercises can give women the illusion that they have dealt with their fears, but I really believe for most all they do is make them think their fears are gone, mostly they just put women into denial and avoidance as they are told if they give power or too much thought to their fears, they will come true. Actually, women who talk about their fears and are willing to explore them, learn more about themselves and how they can cope with anything that comes their way, and have broad expectations of how birth can be, are more likely to be prepared for birth, in turn less fearful and less likely to be traumatised. This is one of the prime reasons I now mentor couples through Birthing From Within classes, as one of the main goals aside from preparing couples on all levels for birth and parenting, is to prevent birth trauma. Preparing to have your first baby or adding another child to the family can be an exciting, confusing and overwhelming time. The day you give birth is a day you will remember forever, so why not give yourself the gift of preparing on all levels for what’s to come? Birthing From Within classes are a truly unique preparation for you and your partner, and I am here to support you to find your way in exploring what is most important and most helpful for you. Everyone is different and there is no exception when it comes to birth and parenting. Rather than being given some magic formula for having a baby, each couple will take away something individual and personal for them, while gaining confidence in being able to cope with labour pain as well as anything that may come their way. 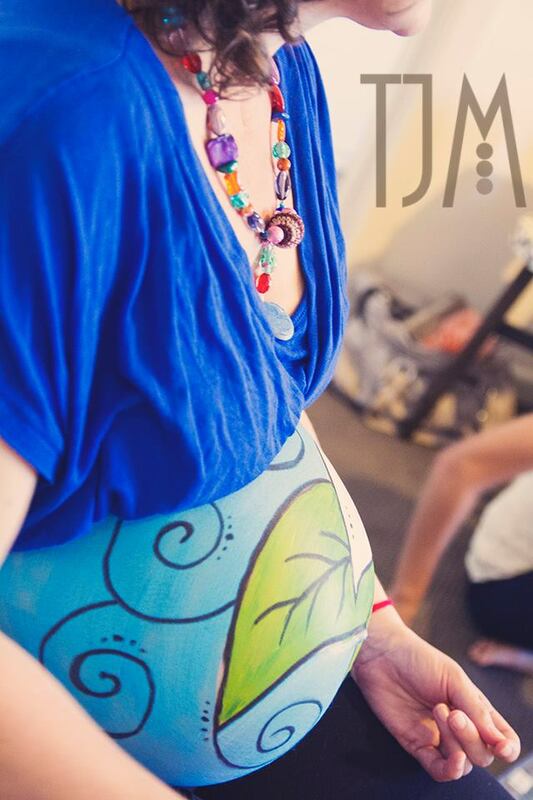 Classes are balanced with a variety of information, practical exercises, pain coping and introspective exercises, which makes Birthing From Within the most holistic birth preparation available. I began my journey by offering HypnoBirthing classes in 2006, and I found some great aspects to the classes, but was also aware that it’s idealistic nature really isn’t right for everyone as they approach birth. After a lengthy search I found a completely unique birth preparation style in Birthing From Within and while it does share similar ideas with HypnoBirthing in it’s mind over matter approach to pain coping, there really is nothing like it! I realised that every couple needs to be prepared for birth and parenting and anything that could come their way, and understand that these things come with unpredictably and surprises, and being prepared for this is a much more holistic approach. With my experience of both methods I bring a very extensive and unique mix of tools to help you in preparing for the birth and your baby. As a Naturopath I can also offer help with nutritional, herbal, homeopathic support for pregnancy and birth as well as breastfeeding support and baby care.